A year ago, Sweden's foreign minister Margot Wallström went to Cairo. It was her first official visit to anywhere outside the EU. We know now the Cairo conference was not the biggest of successes: the Iranian mouthpiece PressTV reported half a year later ["No home rebuilt in Gaza after 2014 Israel war: UNRWA", April 23, 2015] that things were barely moving. According to Chris Gunness of UNRWA, his agency had gotten funding that barely enabled it "to reconstruct 200 of the 9,161 houses totally destroyed." What a mess. "heroes... [because] we plan to recognise the Palestinian state. That is why we are placed in a category of heroes here... They are very pleased and hope this will inspire others. One also believes it is courageous of us to lead the way and so have been very well received." It's easy to imagine Ms Wallström getting a kick from the sort of attention she received in Cairo. On the whole, 2015 has not been a fun year for her and her ministry. Fawning attention, as well as admiration and respect, have been in short supply. This is particularly true of its (and her) broader Middle East strategy. Even we ripped into it - see "20-Mar-15: A peek into how Middle East politics work in reality". Fair warning: don't read it if you're looking for flattering observations about Sweden's foreign minister. 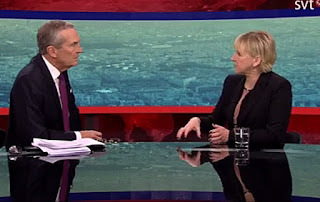 Now, in the wake of Friday night's horrific terrorism inflicted on Paris, we get a sense of where that uplifting feeling of being someone's hero has brought Margot Wallström and the government in whose name she speaks. It would be unkind, too simple and, in a serious way, misleading to treat the Wallström formulation (Middle East situation = desperation or violence = Paris restaurant patrons are machine-gunned) as constituting a moment of Swedish madness. It gets even more explicit. 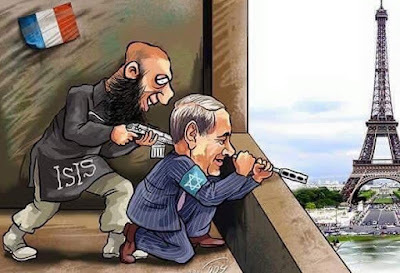 It's reported today that a featured op-ed in the Palestinian Authority's official daily newspaper, Al-Hayat Al-Jadida, says the Mossad, Israel's national intelligence agency, orchestrated Friday night's Paris massacres. Sweden's foreign minister may have been having a very bad Friday. Or she may actually believe the counter-factual and deeply offensive "explanations" she offers for the ISIS savagery in France. We're not sure. But there's little doubt her views do pretty accurately reflect those of large numbers of people. In a MEMRI video clip from March 2014 [online here], Abaaoud delivers a monologue from a trench in Syria, stating that it is "nice to see... the blood of the infidels". He makes no mention of Israel, Palestine or desperation. He does however ask rhetorically "What can be sweeter than martyrdom in the path of Allah?" It would be a mistake to dismiss this lust for death and blood as among the reasons young European Moslems are making their way to the killing fields of Syria. And from there to the boulevards and cafes of Paris. Most of us have our own ways of feeling good about ourselves and life. We now know something about what brightens the Swedish foreign minister's mood, and the same for Europe's most hunted Islamist. Each, in his and her own way, is delusional and simplistic. Each undermines the logic of the other, but the views of both are, in the end, marginal. When it comes to the lethal dangers of terror, the rest of us - and our political leaders - cannot afford to be sucked in by self-serving ideological cant.